Galaxy Note 5 S Pen Action memo: Write memos quickly and link actions to them. You can make calls, send messages, search the web, and more. 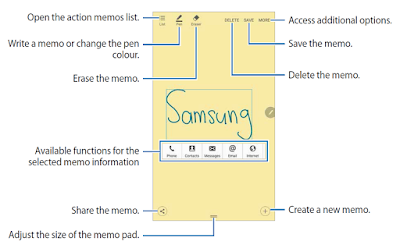 The S Pen Action memo tutoral open the pad and create memos to perform various actions using the written or drawn information. On the Air command panel, tap Action memo. Write or draw a memo. Select a feature. The app related to the selected feature will launch. Tutorial Viewing memos On the Apps screen, tap S Note → → Action memos. Select a memo to view and edit it. Tutorial Minimizing Action memos Create a floating icon for the Action memo pad so that you can quickly write and edit memos at any time. While composing a memo, tap MORE → Minimize. The memo will minimize to a pop-up icon. However, the memo will not be saved until you tap SAVE on the memo pad screen. To move the pop-up icon to another location, tap the icon and drag it to a new location. 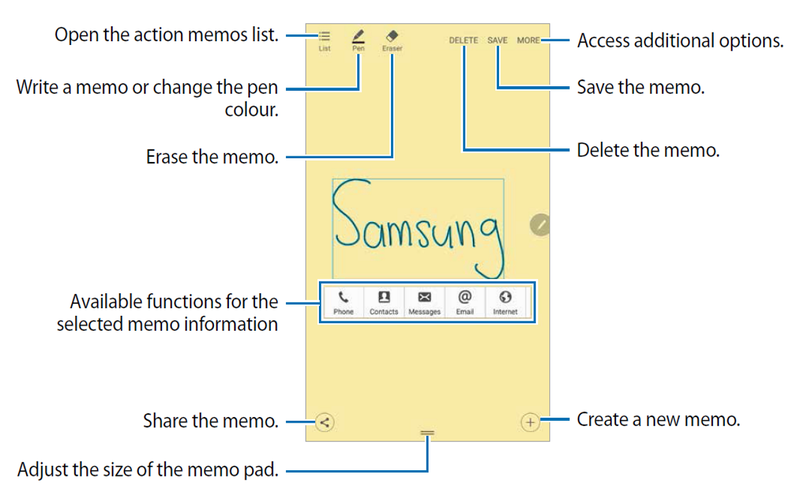 Samsung Galaxy Note 5 S Pen Action Memo Tutorial To save the memo, tap the pop-up icon and tap SAVE. The memo will be saved in S Note and the pop-up icon will disappear.